Finding a nice set of pistol grips that fit my personality was not an easy task. 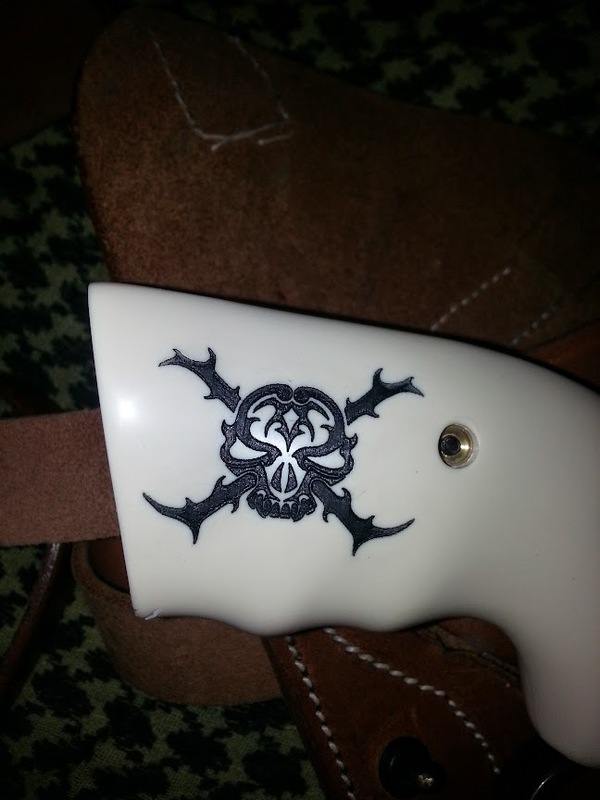 That is when I started looking for actual custom pistol grips that I could send in my design to have scrimshawed on. Several companies that I spoke with would only do their designs or promised “custom” work that had to be sent off to another company to complete. Finally I found one company that would actually do what I wanted without trying to make me pick one of their stock designs. Boone Trading Company actually specializes in ivory, bone, simulated ivory, scrimshaw, and various other animal products. 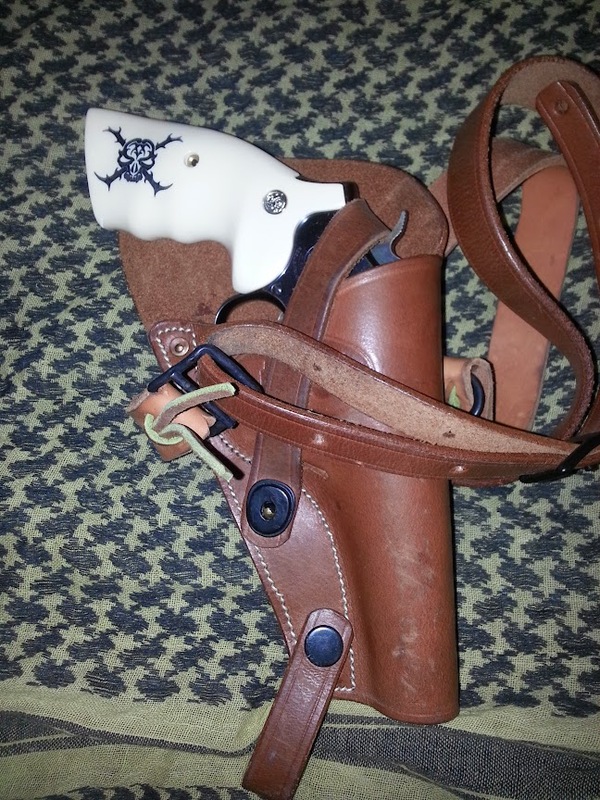 When I contacted them back in the middle of February I picked out some simulated ivory grips for my Smith and Wesson Model 10-1 and sent them some graphics to have scrimshawed. They originally promised me a final product in about 3 weeks. This would get me my grips by the beginning of March. The grips never came so i contacted them again and they told me that they had gotten behind, but the were going to expedite my order. This was in the middle of March. My order arrived at my door on May 1st. It ended up being around 11 weeks from order to delivery. At first I was kind of irritated at the prolonged and stretched out fulfillment of my order. Although I do a lot of business with custom makers, I do expect that my orders will be completed within a few weeks of their initial time estimates. Waiting an additional month is not uncommon, albeit a bit annoying. This is just the nature of the business when ordering custom work. An additional 8 weeks is a bit excessive however. Even though it took a long time, I am really happy with the final product. The quality of the grips and the actual scrimshaw work is quite good. I am a bit of a perfectionist when it comes to custom work and expect to receive every dollar’s worth when I pay for things. For example, I have one hand forged custom knife that I paid over $500 for and then sank another $200 in a sheath. The money I paid was definitely worth the products I received. I feel the same about these grips. They were almost as much as I paid for the actual pistol itself, but they really make the firearm mine. Here are some shots of the new grips on the pistol. The artwork you see here was a piece that I had an artist do for me several years ago. This will eventually be (and fairly soon) my newest tattoo across my back. I am quite partial to skull and crossbones type art, which you can see in both these pieces of scrimshaw. The holster you see is an old military M3 chest rig. I did add an additional pieces of leather to lengthen the strap. I wanted it to ride a bit lower on my side as more of a Baldric type rig. 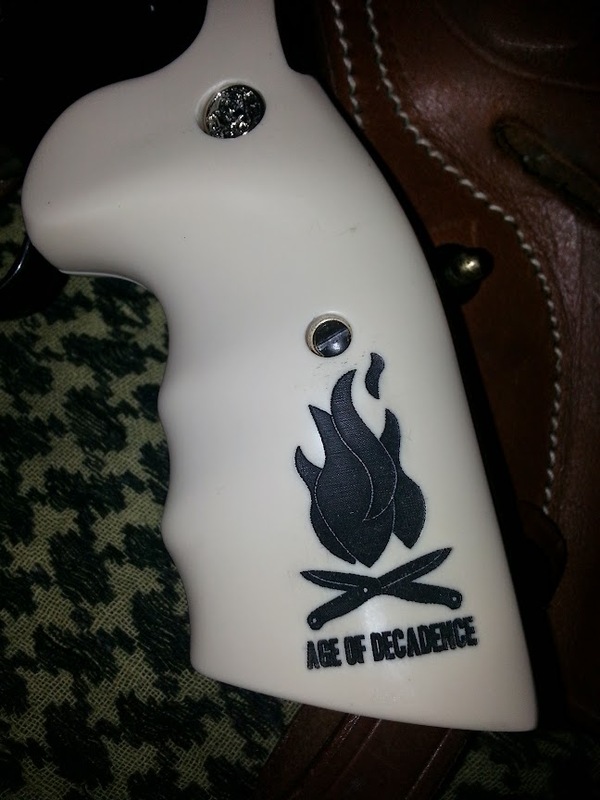 Here is a good picture of the other side of the pistol. Both of the pieces of artwork came out quite nicely and look really impressive against the dark blue color of the pistol frame. I was impressed with the quality of the scrimshaw work. I do not think that it will discolor or chip very easily. Here is a close up of the other side. As you can see, they did do a very good job on them. As with any custom work, you need to keep in mind that the one doing the work is usually an artist. Their freedom to work at their own pace is directly representative of how nice of a final product you will receive. Don’t give up on a company or a maker just because they did not meet you proposed deadlines. Let them do their job and they will get you what you want eventually. Also, remember that you will get what you pay for. Custom work doesn’t come cheap. In evaluating this company and the work that they produced for me, I would definitely buy from them again. I have already started thinking about some other projects, actually. 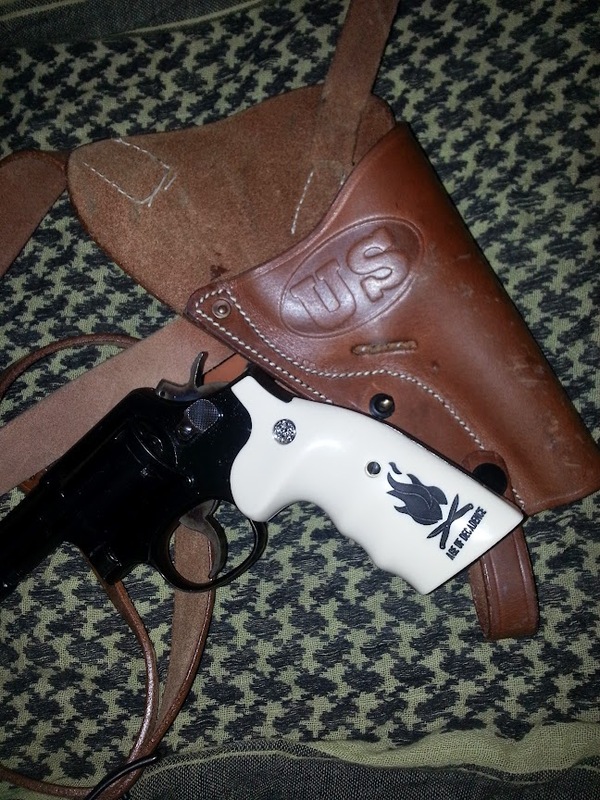 This entry was posted in Firearms, Miscellaneous and tagged artwork, custom grips, custom pistol grips, imitation ivory grips, pistol grips on May 4, 2015 by Woodsbum.